Synopsis Robert Hitchen is one of the game's true greats having won more than 70 tournaments including the legendary Champion of Champions at the Waterloo and has represented his county of Yorkshire on almost 100 occasions. John Spinks is one of the stars of tomorrow. He has already made more than 50 junior county appearances, won more than 15 tournaments, and in 1995 became the British Parks Junior Player of the Year. Sub-titled 'Know the Game', this was volume one of a scheduled two-volume series and is aimed essentially at beginners. It covers the basics of the game and emphasises the need for a smooth, consistent delivery which is examined in detail through the use of different camera angles and slow motion. Other aspects considered include choice of bowls, correct grip, the importance of practice, controlled strength shots and the purchase of accessories. 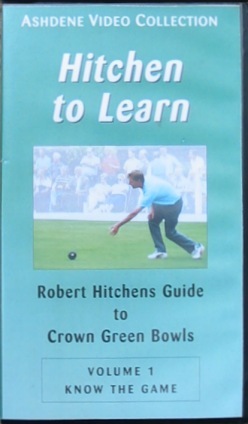 The closing sequence of the video gives brief details of volume two, entitled 'Play Winning Bowls', which was scheduled for release in the summer of 1998. However, I have learned indirectly from Robert Hitchen that this video was never produced.